Quilting Adventures: UFOs in the closet....! Back in February 2007, I had become a member of the Stashbuster yahoo group. That year, I decided to join their UFO challenge. It was a perfect opportunity for me to finish some long over due projects. I began this challenge by doing an inventory, well okay, cleaning out the dust bunnies so to speak! Once I had an inventory of all of my on going projects, I decided that it was time to keep a list. I remember Nancy, from Nancyquilts, commenting on how I was just a baby in the UFO department! She had 86 UFOs! Not sure my heart could take it! lol I wonder how Nancy is doing!? As you can see, many of those projects have been completed. What I have done, is continued a yearly listing of each project I start. This allows me to know the year and date I began and finished my projects. Now I'm curious, how you organize your ongoing projects? Do you keep a list of your projects? All this to say, my guild Franklin County Quilter's Guild, is doing a UFO challenge! I thought it would be a wonderful opportunity for me to work on the "prior to 2007" list. 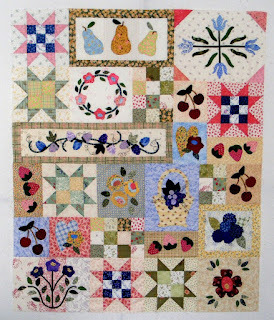 Sunday, I dug for a project to add to the new challenge list and decided on Wildberry Vines by Nancy Odom of Timid Thimble Creations. This project was on the original 2007 Stashbuster UFO challenge and did cost me a penalty of a FQ! 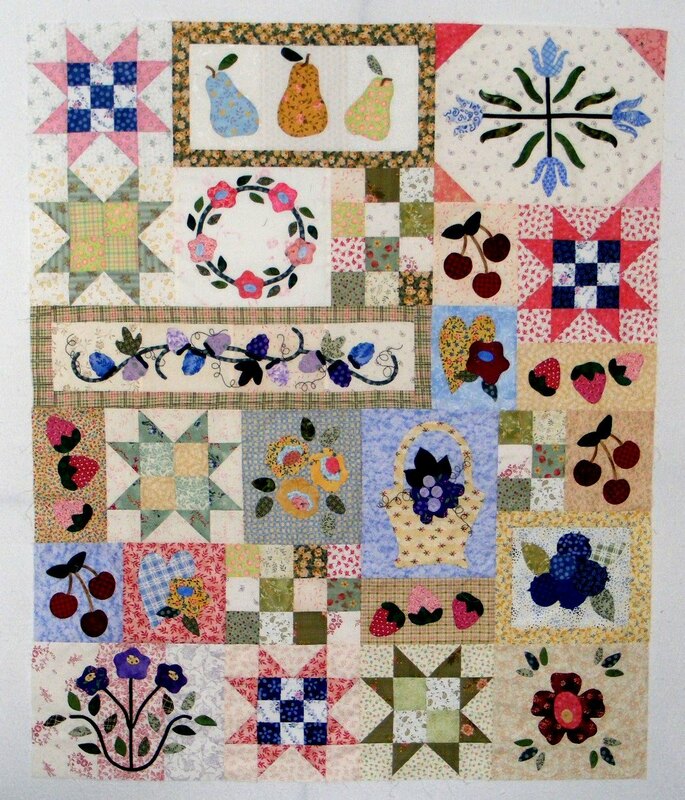 Should you wish, you may read the story associated with this quilt here. Harmed with determination, by 2:00 a.m. I had pieced the center of the quilt! Yea! There really wasn't much left to do on it. Trimming the blocks and doing a bit of hand embroidery in (2) two of the blocks. Oh the organisation makes my head hurt! Super super organised! I have a vague hand written list...it would be a good idea to tidy & get realistic with what lurks in the shadows!!! LOL! You might inspire me. Yeah, I tried to make a list, but it just made me stress! So now I just do what I fell like when I feel like it! I like the idea of an inventory schedule of projects and I think I will do just that. Your quilt is very pretty! That is a beautiful quilt! I bet you are happy to be finishing it. Lovely colors too. I'm never that organized, most of my list is in my head somewhere. You've accomplished finishing many UFO's on your list. You haven't been blogging much...I miss your posts.